If you are looking for a great backpack to carry you laptop while skateboarding around, the DC Vartar skate backpack is your best choice. 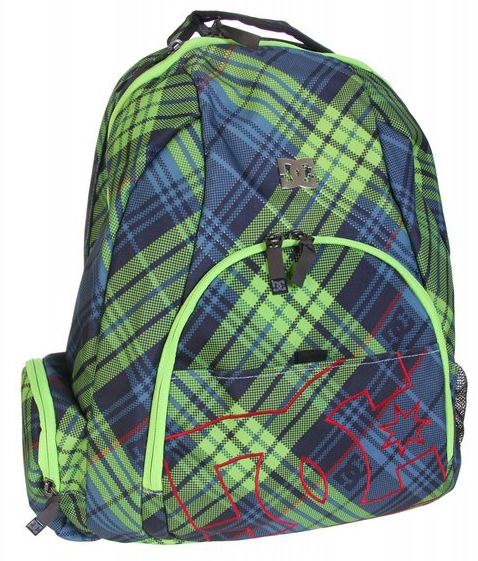 This skateboard backpack, made of denim, designed with a cross section of blue and green plaid is stylish and roomie. The front pocket has multiple compartments to store and organize your things. On the side of this bag is a water bottle holder to hold the drink of your choice. This backpack comes with a built in laptop sleeve to hold and protect your computer while transporting it on your back. DC pays attention to the fine details on the Vartar backpack. This bag is quite popular so get yourself one now while supplies last.